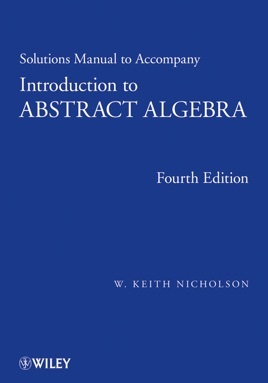 An indispensable companion to the book hailed an "expository masterpiece of the highest didactic value" by Zentralblatt MATH This solutions manual helps readers test and reinforce the understanding of the principles and real-world applications of abstract algebra gained from their reading of the critically acclaimed Introduction to Abstract Algebra. Ideal for students, as well as engineers, computer scientists, and applied mathematicians interested in the subject, it provides a wealth of concrete examples of induction, number theory, integers modulo n, and permutations. Worked examples and real-world problems help ensure a complete understanding of the subject, regardless of a reader's background in mathematics.